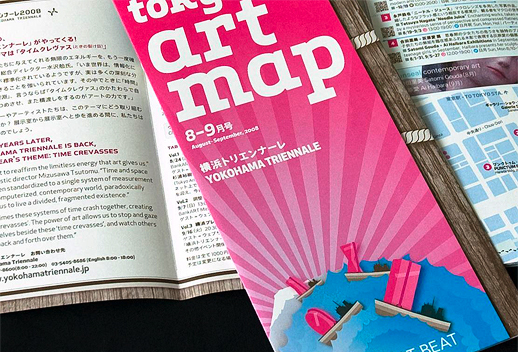 Tokyo Art Map #3 is out now! The August-September issue of the art map is out. It introduces 50 popular events in Tokyo, with a preview of the Yokohama Triennale starting in September. We have spread 100,000 of them throughout Tokyo in more than 300 locations!! Have you seen them?! What a nice cover, isn’t it! International art on its way to Yokohama for the Triennale. Massive art pieces ready to take over the port city for 2.5 months during the 2008 edition of the international contemporary art festival started in 2001. What is the Yokohama Triennale you ask? Well, this is exactly the type of questions we’ve built the Feature Section of this map issue for. You will find a quick intro to the Triennale, its concept, how to best enjoy it and the city, and details on the locations it will be happening at. Alongside it, you will find details on more than 40 events happening in 9 other areas of Tokyo: Roppongi, Omotesando, Harajuku, Ginza, Shibuya, Shinjuku, Kyobashi, Ueno, Kiyosumi-Shirakawa. 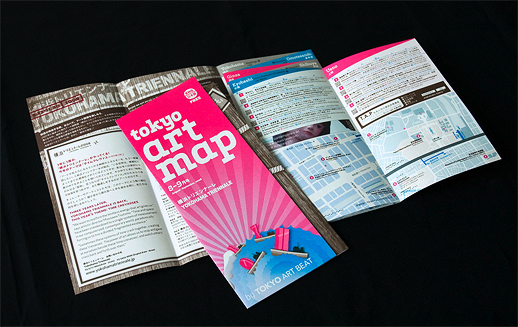 Remember that the map is free, bilingual, fits in your pocket and is a great tool to enjoy this hot (and sometimes very rainy) summer 2008 in Tokyo! You can download a pdf version of the map here, which prints on 4 A4 sheets!